My thanks to Roger Andrews for his continuing efforts to uncover some of the bigger egregious errors and mannipulations in the historical temperature record. 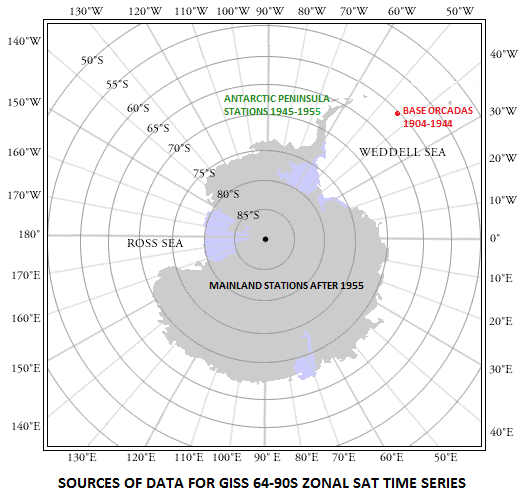 Here he examines the long term Antarctic record as published by Jim Hansen’s NASA-GISS. These lines from Byron’s “Ode to Bonaparte” provide a fitting introduction to this short post, which I’m submitting as a filler while I delve ever more deeply into the regional, hemispheric and global atrocities committed by GISS’s homogeneity adjustments. This graph shows that there are in fact two temperature records in the South Orkneys – Laurie Island GHCNv2 and Louise Laurie Island GHCNv3, which is something I didn’t know when I wrote the post. Laurie Island (GHCNv3), which shows warming, is the one that GISS and just about everyone else uses as “Base Orcadas”. Louise Laurie Island (GHCNv2), which doesn’t show warming, appears as “Base Orcadas” in the KNMI “adjusted” GHCNv2 data base. So it seems that GISS based all of its Antarctic series before 1945 on a demonstrably contaminated and heavily ‘adjusted’ record from a station located miles outside the Antarctic. Interesting that we are not getting any true data of ALL the Antarctic. Just a couple places at different latitudes. The difference of latitudes itself can have a very profound effect on data collected. Is this an alignment of anomaly time series with no overlapping periods? Officially no, but as it happens the answer is yes. Not much doubt about it – the Navy generated a +/-1C artificial upward shift in the Orcadas record after 1951. Take this shift out and the record shows effectively no warming before 1980. Given the interior is at high altitude, somewhat isolated from global effects and the poles have the greatest temperature variation, a zero change at Scott base is notable. It is my current belief that there is an earth north/south cyclic change in temperature. This is born out by a number of datasets. I also note that this fits with phase leading asymmetry solar data. Whether this is magnetic or perhaps UV coupling, I have no idea. Lost interest some time ago. Tim, a lot of people have talked about a north-south ‘see-saw’. I don’t thik it’s an evenly balanced thing. I think the pacific ocean shifts more heat northwards via the n. atlantic when the sun is active. For the south, the circumpolar current keeps things more stable. 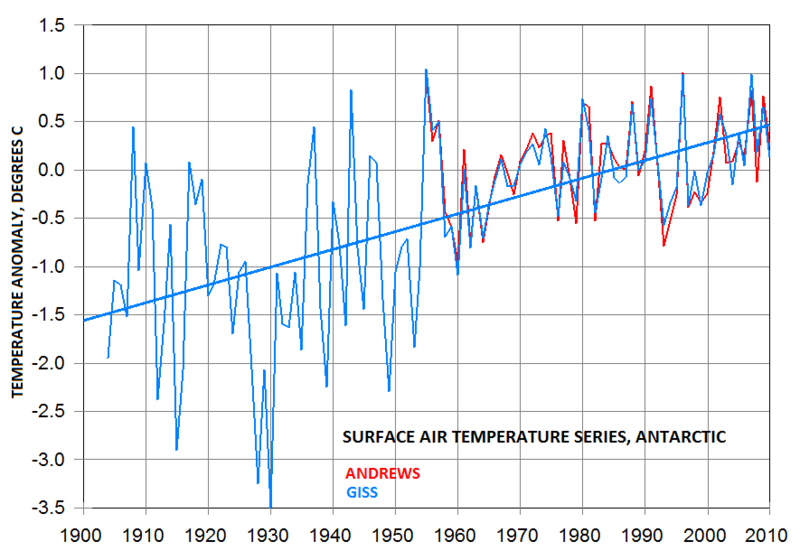 About 2C of surface warming in the Antarctic Peninsula since 1943. 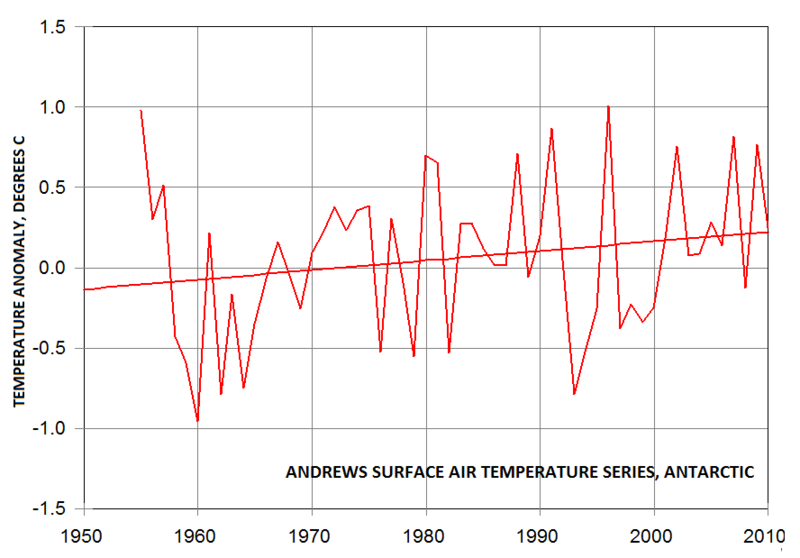 No change in mean surface temperatures on the Antarctic mainland since 1955. No change in mean UAH TLT over the Antarctic mainland since 1978. No evidence for any cyclic relationship with NH temperatures. But – and going way O/T myself here – a thought occurs to me. If the Antarctic is climatically isolated from the rest of the world by the circumpolar current, as it appears to be, then we can consider it as a kind of sealed chamber in which we can study the impacts of increasing CO2 without worrying about extraneous effects. 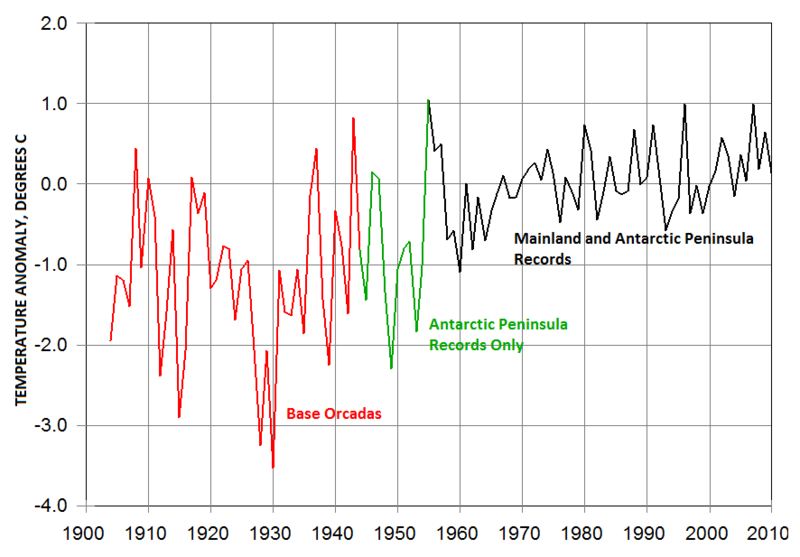 And since 1955 CO2 in the Antarctic has increased by about 80ppm but temperatures haven’t increased at all. According to the CMIP3 multi-model results there should have been 0.9C of CO2-induced surface warming in the Antarctic since 1955. Roger Andrews: thanks for the plot. I expected that to be the case as similar is seen in many climate datasets where anomalies are used. Typo in the heading. Should be ‘Mannufactures’. There is little or not warming at all in Orcadas. There is no reason to ask why GISS cutted Orcada post 1945 temps away. Good find. I missed that. But that’s KNMI’s version of the adjusted GHCN Orcadas record. Their unadjusted GHCN record is the same as the one I show above. I’d love to know who did the adjustments. It certainly wasn’t GISS or GHCN v3.2. The increasing ice area of the Antarctic certainly does not indicate warming. There were comprehensive records of the weather in McMurdo Sound for the two Scott and Shackleton’s expeditions. I have seen their temperature screens and the books decscibe the trials of the record collection. Mawson also kept records as did Byrd. These could be used to check correlation (or not) with the South Orkney. ChrisM: There seem to be two Base Orcadas (South Orkney) records to correlate with – the “unadjusted” KNMI record that TimoH linked to above and the GHCN v2 record that everyone else uses. I’ve emailed Geert Jan van Oldenborgh at KNMI to ask him where he got the unadjusted Orcadas record from. There were several interesting things in that paper. They disregard the early polar explorers’ records, claiming nothing before the 50s. They also use ice core data. Isn’t that the same information which Thompson won’t publish or release? The ice data says that the Antarctic peninsula and especially not South Orkneys is not indicative of the rest of Antarctica. There goes Steig and GISS. The missing CO2-driven 0.9°C since 1955 is about as pure a test of the GCM algorithms as you can get. Well, not quite true, but I doubt we can get any sensible annual averages out of Scott or Shackleton. Would it be worth my trying to obtain what there is? I have examined the Base Orcadas series – although was unaware of the different provenances. There is a –ve relationship between Reynolds ice cover anomalies and temperature anomalies, also as you might expect. The temperature on Orcadas does correlate with that on South Georgia, but I haven’t investigated closely. A brief look shows that there may be something going on. South Georgia is available for 1905-1981. For the period 1905-1950 the average difference in annual anomalies (i.e. Base Orcadas anomaly – South Georgia anomaly) is -0.2C. For 1951-1981, it’s +0.3C (so Orcadas anomalies were on average half a degree higher over this period). That said, I have massaged the data and infilled, so the numbers should be taken with a pinch of salt. I have intended to put some graphs together for a blog post, but have yet to get around to it! Finally there are some excellent photos of Base Orcadas on Google Earth by a user called Manu_mdq – worth checking out. You have solved the problem. Thank you. There are two Base Orcadas records – Laurie Island and Louise Island. Laurie Island is the one that gets reported by just about everyone as “Base Orcadas” because it’s longer and because it shows warming. Louise Island, which doesn’t show warming, gets reported as “Base Orcadas” only in the KNMI adjusted GHCN v2 version, I suspect by mistake. 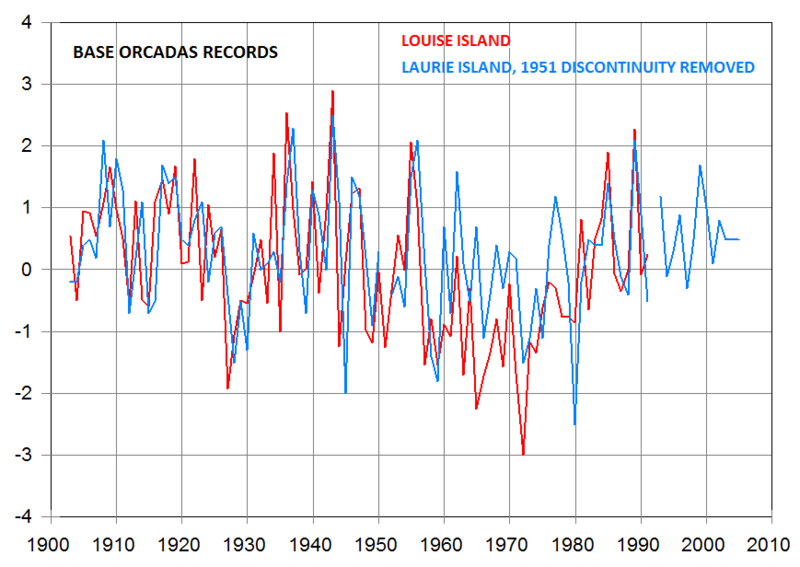 And if you adjust the 1951 artificial shift shown on the graph I posted above out of the Laurie Island record (here it is again below) it tracks the Louise Island record quite closely. So not only has GISS based its entire Antarctic series before 1945 on a corrupted record that lies well outside the Antarctic, it has ignored what appears to be a good record sitting right next to it. I’m not sure Scott or Shackleton would give us any usable data, but in the context of long-term Antarctic warming Schneider et al (with one of the als being Steig, incidentally) strikes me as a good fallback position. in the context of long-term Antarctic warming Schneider et al (with one of the als being Steig, incidentally) strikes me as a good fallback position. ……. ooopsie, time to play the man-made ozone hole card ?? I was referring to their Figure 3a, which shows zero warming since 1800. That’s from the ice core proxy of course. Yes, it does seem like a pretty good falsification of the enhanced greenhouse effect really. Considering the Earth radiates strongly in the 14um band at around Antarctica temperatures, where co2 absorption is strongest and there isn’t much water vapour around…and comparitively little energy is needed to change temperature quite a lot. If extra co2 can’t do the business in the Antarctic, then it doesn’t look good for the AGW theory. I’m sorry for my mistake, and I can assure you I only intended to show the difference between the two versions of GHCN (adjusted) data w2/w3. Shakelton’s men were left for 2 years or so on the opposite side of Antarctica from where he was starting his trans-Antarctic trek. They got sick, mentally and physically, but they were super-troopers who probably continued to take their scientific measurements even though their supplies moved out to sea on the ice, at least one member died (it’s been a couple of years since I read about the ones “left behind”), and they thought they were abandoned forever. But how do you drop in data that doesn’t have overlap? Elephant Island is at around 61S, so about the same as Orcadas. Maybe the absolute temperatures would be useful after all. If you’re still around, could you please give me a link to the exact site from which you downloaded the Louise Island record? Thanks. The South Orkney Island station you mention at 60 degrees 44 minutes south latitude is not outside the Antarctic today. By the Antarctic Treaty, signed in 1959, the Antarctic includes everything south of 60 degrees, which includes the South Orkney Islands, the South Shetland Islands, and the Antarctic Peninsula. [Reply] We are talking about real-world climatic zones, not politically decided international borders on maps. I realize it is more than 10 years old now, but it may be updated.